Well, golly. Let’s have a warm round of applause for our two guest posters, DJDeer and Tinx! I’m quite impressed and was literally LOLing throughout most of their posts. I clearly need to step up my game. My 9 month plan has left me complacent. Those two guest posts are tough acts to follow – I’ve neither a creepy mermaid ballet and fries that look like poo adventure, nor have I a gaycation complete with a bacon-draped bloody mary tale to tell. In fact I have nothing draped with bacon at the moment. Woe is me. What I do have, though, is a story of the FUTURE! Ha! You doubt me? You can see for yourself in the picture above, I ate a burrito on 25/45/2165. While I can’t tell you much of what is going on in that time (you know, the whole space-time continuum thing), you can at least figure out that 12/21/2012 is NOT the end of the world. Sorry Mr. Cusack! How did I come to find myself in the future eating a burrito of no ordinary description? Well I was in San Jose with Vic for our good friend Twin’s wedding, and via Man v. Food had heard of an epic burrito to be had at Iguanas Burritozilla. 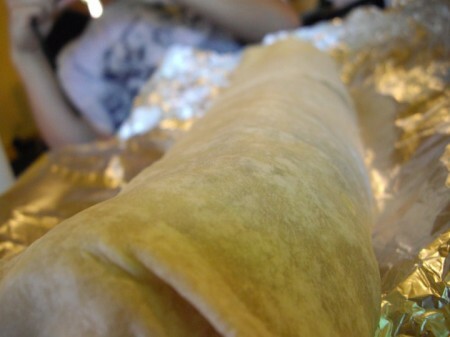 The burrito itself was aptly named Burritozilla; it is 18″ and weighs in at just over 5 lbs (!) of pure burrito deliciousness. Pair it with a drink and the two items round out nicely to about 20 buckeroos. If you look closely you can see that the burrito was LONGER than the diagonal of the tray. Even then Vic and I had no idea what we had gotten ourselves into. 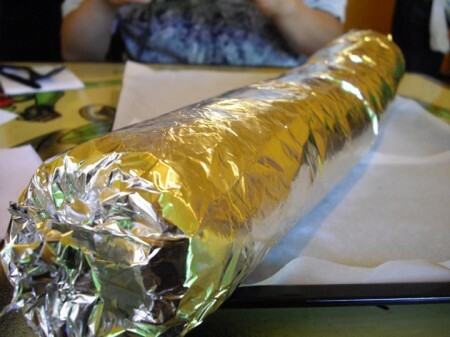 After unwrapping it, we just thought of it as just another burrito. Put me in your mouth! Nommmmm. The ingredients were not groundbreaking, just your standard Carne Asada, Rice, Black Beans, Cilantro, Tomatoes, and Avocado. Standard they may have been, but no less delicious. Armed with knife and fork, Vic halved the beast and we started in on our respective parts. Let me tell you, that first 5 or 6 inches were heavenly. 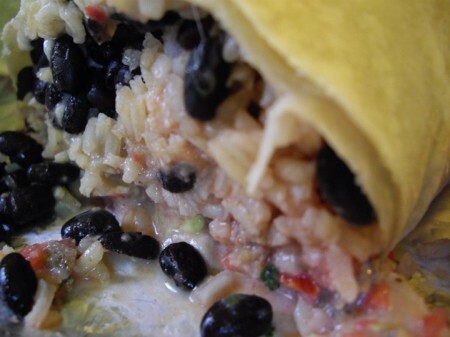 The ingredients were distributed evenly throughout, so there weren’t just bites of rice or beans. I could hardly stop stuffing my face with it. Vic seemed to holding his own, and we had garnered the attention of a few locals. “FOODIE STARDOM!” I thought. If I had only seen through the carne asada induced haze, I would’ve realized that their smiles were ones of pity and not kindness. After those first 6 inches, DEAR LORD the pain. The feeling of fullness hit so quickly I wanted to roll over and die. Since I figured my half of the burrito was 2.5lbs and I had managed to eat over half of it (1.6lbs or so) in about 30 minutes, I deserved a break. Me: Dude, I need a breather. This sucker is expanding inside of me. Vic: Me too man… how do you like it so far? Me: It’s pretty good. The meat is cooked well and there’s a lot of flavor coming through. Vic: …I should tell you that I had a big lunch 2 hours ago. That’s when it truly spiraled into a pit of doom. or maybe the pit of my stomach. That place. Anyway, Vic assured me that he would do his part to eat as much of the burrito as possible considering his situation, and that I shouldn’t worry. At most I’d have to eat maybe an inch or two of his half. AT MOST?! With 2 inches left on my side, I already wanted to die. Still, the AZN inside of me said that I couldn’t waste the food (the RICE! YOU CAN”T WASTE THE RICE!) and in the next 30 minutes I powered through to finish my half, bite by painful bite. I could see from Vic’s face that he was also to the point where he was in pain yet dutifully finishing his food. With 2.5lb of burrito inside of me already, I anxiously watched him, fearing the worst. 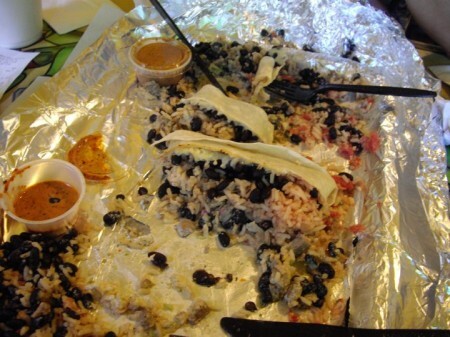 And with about 2.5 inches of burrito left, the worst happened. He tapped out. Vic: I can’t do it anymore, man. Me (almost hysterically): Oh come on, just a few more bites see?! Vic: No dude, you’ve gotta finish it for me. The AZN took this moment to once again scream (THE RICE! EAT IT. SAVE IT. DON’T WASTE IT. WHEN I WAS YOUR AGE WE DIDN’T HAVE MUCH …). The AZN seems to share a timeline with my father. Curious, that. So I went for it. I grabbed my fork and dug in, had two bites, and needed a breather. 5 minutes after that I started in earnest. Only to stop 5 minutes after that. I can feel it gloating, basking in its victory. Vic bravely managed about a half inch more, but we were done. All in all I had roughly 2.7lbs of burrito and I was near tears from eating too much. The mere hint of a thought trying to finish made me throw up a little in my mouth. We clearly were not fit to live in the future, eating future burritos. We stood up, threw the remainder away, and made the obscenely long waddle (seriously felt like waddling) back to our hotel 3 blocks away. I think I died a little that day. On a happy note, the overall weekend was awesome as Twin was a perfect bride and I could not be happier for the lovely couple. 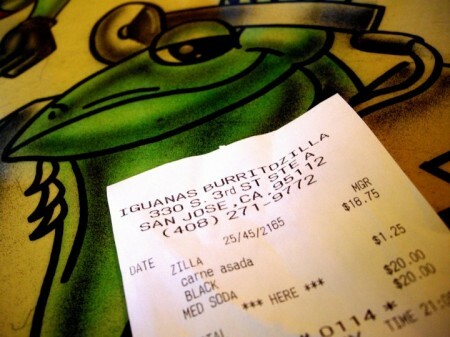 Anyhoo, if you ever find yourself in San Jose OR the future swing by Iguanas. The burrito was tasty and if that is any indicator of the rest of the food, then you’re still in for some good stuff even if you don’t take on the Burritozilla. This entry was posted by Daniel on May 27th, 2010. You can follow any responses to this entry through the RSS 2.0 feed. You can leave a response, or trackback from your own site.